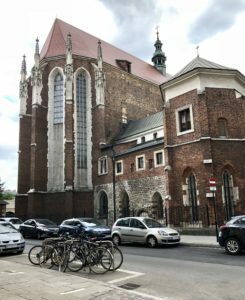 Today we set out early in the morning and drove from the quaint city of Wroclaw to the larger and much older city of Kraków. With a long drive ahead of us and a lack of WiFi, we found new ways of entertaining ourselves, including making up our own card games and riddles, and of course the intermittent napping. Towards the end of the drive, our tour guide, Winnie, gave us some history on Kraków. As Berlin and Wroclaw remained war zones for many years during WWII, they were eventually forced to rebuild much of their infrastructure. Because of the renovations, the cities were a mix of older historical sites with more modern buildings. On the other hand, Kraków was never attacked or occupied by the Nazis and remained under the control of the Communist regime for many years. This influence was seen very clearly as we drove through the outskirts of the city; the buildings were drab, colorless, and very uniform. As we entered into the Old Town square, huge towers and old gothic churches dominated the landscape. Although Kraków has such a history of oppression, it has clearly rebounded to become a lively and rich community filled with cafes and museums. 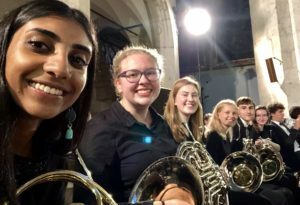 After spending a few hours walking around the square, eating lots of pierogi and other Polish delicacies, and listening to the hourly trumpet player sing from the church tower, we left and headed to the Saint Katherine’s Church for our late afternoon rehearsal. As we followed our guide through the church to our storage spot, it seemed as if we were traveling into some sort of labyrinth. The church was extremely old, with crumbling walls, underground tunnels, and high arched ceilings with the occasional bat flying around. After rehearsal we walked into the Jewish Quarter of the city for a quick dinner in our own groups and then headed back to the church for our concert. Our repertoire list was slightly modified to fit into the traditional values of the church, so a few of our pieces were replaced with. The venue was packed with an array of locals, tourists, and families. The audience remained charged and eager to show their appreciation throughout the concert. After the concert ended, a local boasted to my friend and I about how professional and prepared we sounded as a youth orchestra, and compared us to professional orchestras he had seen. 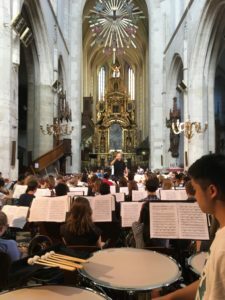 Although it may be hard to top the Berlin Philharmonic, maybe our time at the Krzysztof Penderecki European Center of Music will bring us a few steps closer.